Did you know that there are more peanut brittle recipes than there are trees in the woods? Wow! We have tried dozens of everyone's favorite brittle and have had great brittle and not so good brittle. But this recipe is by far the best we have ever tasted. Fairly thick but full of air! Crumbly and not hard. Really, really good! And our farmer customers say it reminds them of the brittle their Mother used to make. We hope you like it as much as we do! The best I have ever tasted. And I have eaten a lot of brittle! Homemade and store purchased. I judge brittle by the amount of peanuts in each bite. And yours is by far the most peanuts and the best of a sweet/salty combination. This peanut brittle is the best, bar none. YourInternet description of the peanut brittle prompted me to buy the 30 OZ container of it. It was excellent, packed with peanuts and not overly sweet - a winning combination! I have tried many of your products and especially enjoyed the brittle. So, I ordered a case for Christmas gifts this year. I received the case 1 day after the order. Thanks Bertie County Peanuts! I think we finished off this jar in under a day from when it came. Really good peanut brittle. I wish I had ordered more. A Christmas gift from my daughter that I just could not stop eating - so delicious. Simply the best and always fresh. Hands down, the best peanut brittle I've ever had. Love that it has so many peanuts!! I'm picky about peanut brittle, but this hit the spot. I'd give it 6 stars if I could! The best peanut brittle we have ever had. Love the peanuts also. Will be ordering more soon! First time ordering the peanut brittle. It is just like the other products that I have ordered--Excellent! This is the best peanut brittle I've ever had. Just the right texture and sweetness. Peanut Brittle was my favorite. Sales prices encouraged me to try more of your products. I absolutely love your peanut brittle. It is the nuttiest brittle I've ever tasted. My 89 year old mother ate a whole jar as soon as it as opened! Keep up the great work. This is one of the best peanut brittles around. Highly recommend. This peanut brittle is the absolute best!! Ever time we go to NC we visit Bertie County and stock up!!! Love this stuff for special occasions and gifts for the family. Taste was good but peanuts were soft and tasted old; not crispy like before. Owner Response:We're sorry to hear that. Sometimes the heat and humidity can affect the brittle, especially during the warmer months. We'll be in touch regarding our 100% guarantee. Peanuts are great and the packaging is very nice. I hope everyone in NC will support NC agriculture products. Product arrived in very short period of time. Have not tried the product since it was purchased for a gift. It looks very tempting! Nice packaging. I purchased peanut brittle at the Down East Holiday Show. Enjoyed it so much that I ordered more for Christmas gift and also for my husband. He doesn't usually eat anything sweet but loved your peanut brittle. The peanut brittle was all stuck together. Not what I expected. Owner Response:Sorry about that! We'll be in touch regarding our 100% guarantee. The best I ever had. My father loves peanut brittle. I order it every year for my father's Christmas present. This is his favorite. Every time I by it it always fresh. Never to sweet-just the right amount of ingredients. The product is good. A lot of it was pulverized. Suggest you label the package Fragile and perhaps store it more carefully. Owner Response:Sorry to hear about the problem with the brittle. We'll be in touch! There must be a way to prevent peanut brittle from sticking together into one big glob. Owner Response:Sounds like the heat must have caused some melting. We'll be in touch to see what we can do to rectify the situation. I have ALWAYS received the BEST product from this company. Never had a promblem with any of my orders or product. This brittle is out of this world. Enjoy. The order for 30 oz peanut brittle. Called and was advised problem with that size. Was told that the smaller ones were available. To expedite the shipping I agreed to two smaller ones, not realizing that the smaller one were 9 oz. Received 2 -- you do the math. Owner Response:Whoops! We'll get that fixed. Sorry about that! Bought my first jar and now I'm hooked. They are the best I've had. This company makes excellent peanuts. The brittle is a style that is not the usual. Not easy to break, flavors very muted. After reading g the packaging I think that this is what they were trying to achieve, but not to my liking. It was a bit stale tasting. I thought it was just me but my husband agreed. I bought the peanut brittle because it is some of the best ever. And I found out that my husband bought some as well. Love this company, always the best! Delicious prouduct. Perfect sweetness, not chewy, the crispness from the peanuts preparation is another plus. Definitely buy again. I bought the peanut brittle at Christmas and then again at Valentines for my dad. He loves it!! We became familiar with your products this past summer when my dad was in the area working on a mission project. This is the best brittle I've had. The taste is wonderful and the brittle is filled with lots of peanuts that are well cooked. We are having a wedding this coming June in Raleigh, NC, and want to have Hotel Wedding Gift Bags with the theme of "A Collection of NC Treats and Goodies"! One of the items we wanted to have in the gift bag something to do with Peanuts and we chose your Peanut Brittle. We have put the Peanut Brittle in cellophane bags with a tag sharing information about it. The taste of the Brittle is pretty close to heaven! I fear our guests will want to know if they can have seconds! I can assure you that come Christmas I will be ordering for Holiday gift bags and parties. This peanut brittle is just divine and I am not a big peanut fan- but this brittle is just out of this world. Unlike my past orders of peanut brittle which were excellent, this order is totally different. Very hard and not much peanuts. I was promised a refund that has not happened. 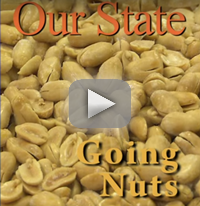 Owner Response:Sorry to hear of the issues with the peanut brittle. 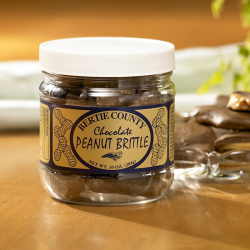 We're sending you a jar of our new brittle to taste test. Thanks! First time trying your peanut brittle. I have never had peanut brittle like this before. Your Honey Roasted and Peanut Brittle are the best. 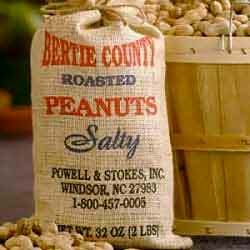 If anyone has ever tried planters honey roasted you will immediately appreciate Bertie County Peanuts. This peanut brittle is great....it's not sticky or hard to chew and there are LOTS of peanuts in it. The flavor is wonderful. I will definitely order this again!!! 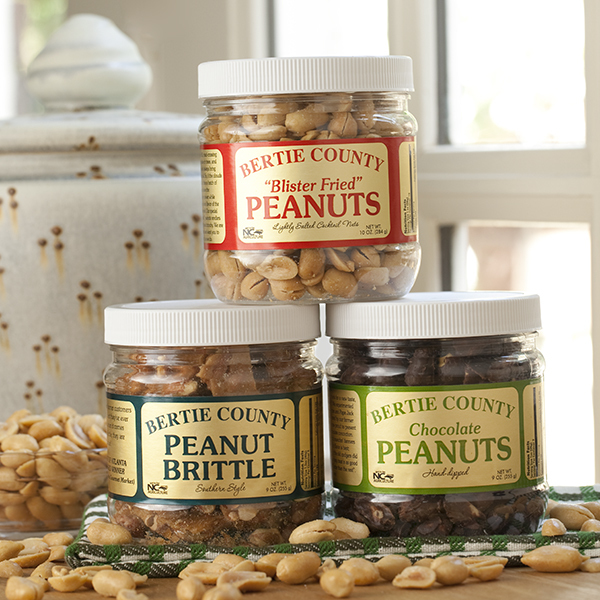 I am so proud to send gifts from Bertie County Peanuts to the special people in my life. I also like to treat myself to a few of those treats! Did not like the brittle this year, too thick. And the taste not the same as before. 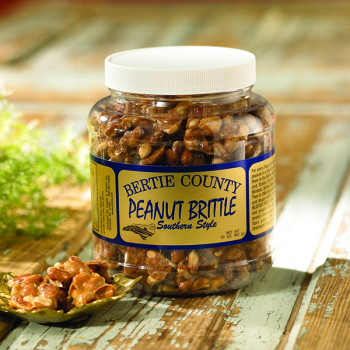 First time trying the brittle, and it's really good, like all the Bertie County products. Thank you so much for the replacement peanut brittle. It is so delicious that I can't stop eating It! What great customer service. I am a customer for life. Thank you again.